Tasiilaq, Greenland, Friday, Feb. 6, 1970. 6 p.m.
Dead silence falls over Tasiilaq. Whatever mid-winter daylight appeared briefly in this village on the southeast coast of Greenland is long gone, leaving the afternoon pitch black. A fresh layer of snow from the morning covers the ground, reflecting the darkness around it. The vacuum of space is clear, and stars glint behind snow-covered mountains. But any hint of pastoral calm is about to be obliterated. The temperature has plummeted to -4° Fahrenheit and is still falling. Suddenly the wind picks up, and in an instant the silence vanishes. Village dogs start barking furiously. Icy gusts whistle through the spaces between the boards of wooden huts, a banshee-like warning of the bombardment to come from ice balls, rocks, untethered sleighs—anything that is unsecured. By now, every creature in Tasiilaq knows: A piteraq is colliding with the town, and going outside into the elements would be suicide. During piteraqs, a torrent of cold air suddenly sweeps down off the Greenland ice cap and thunders down the steep slopes of ice-covered mountains, an avalanche of freezing winds that can reach hurricane intensity and flood everything in their path below. These rivers of air gain even more velocity as they converge and rush through narrow coastal fjords, the steep-sided inlets named by the Norsemen who made landfall here in the 10th century. 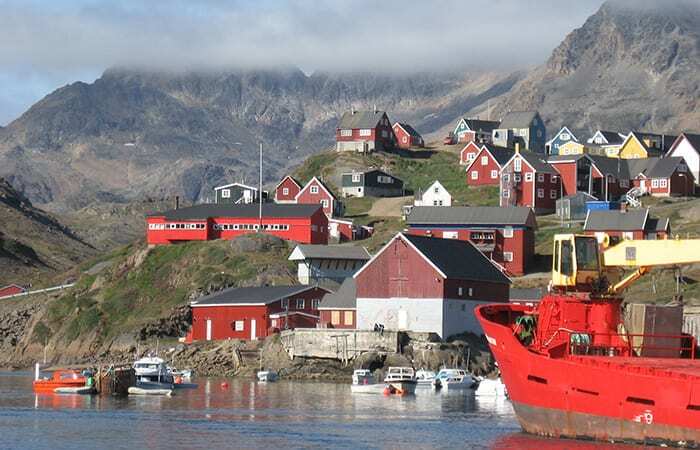 With more than 2,000 inhabitants, Tasiilaq is the seventh-largest town in Greenland and the most populous community on the eastern coast. The 1970 piteraq in Tasiilaq had wind gusts estimated at 160 miles per hour that savaged the town into near ruin. Not all piteraqs are as devastating as that one, but strong winds with speeds above 40 miles per hour can occur as frequently as 15 times per year. They haunt Tasiilaq in all seasons except summer. There is one telltale sign that a piteraq is coming: The sky suddenly becomes clear—indicating that the wind has shifted direction and is now coming from the mountains and the vast Greenland Ice Sheet beyond. After the 1970 storm, Tasiilaq created an officialwarning system that sounds an alarm when a piteraq is forecast and completely shuts down the town until the piteraq subsides. So piteraqs are well known to Greenlanders, but they have not been well studied by scientists. That’s not surprising for a phenomenon that occurs in such a remote, harsh environment. As a consequence, little is known about how they form and what their impacts are. Our goal was to investigate some of these mysteries. With my Ph.D. advisor Fiamma Straneo and colleagues, we set about to do the first systematic study of piteraqs, also known as downslope wind events, or DWEs. 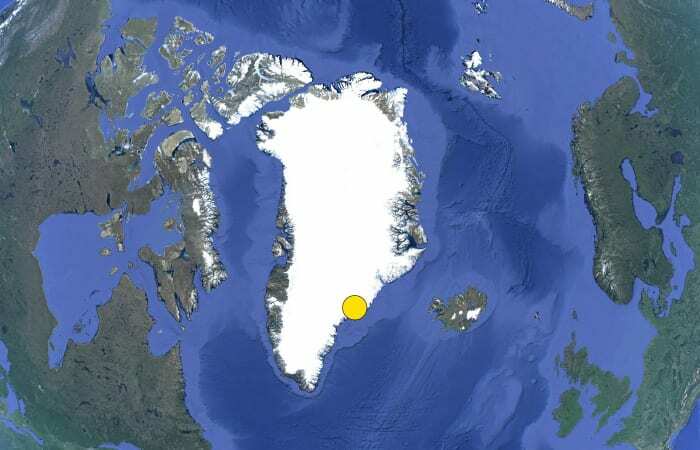 To do this, we analyzed meteorological data collected at two weather stations in the area: one in Tasiilaq that has been operated by the Danish Meteorological Institute since 1958, and another one on a hill in nearby Sermilik Fjord, established by the University of Copenhagen in 1997. The data were collected every three hours at first and more recently in hourly and 10-minute intervals. These stations supplied a lot of data, but in only two locations. To gain insights into the larger-scale setting in which piteraqs form, we used a tool called reanalysis, which essentially helps fill in the missing pieces between and around our two weather stations. Created by the European Centre for Medium-Range Weather Forecast, it’s a computer model that uses measurements from weather stations, satellites, radiosondes (balloons released into the air to collect data from the atmosphere), and other data sets. Then it factors in the laws of physics to reconstruct meteorological measurements where no observations exist. With the reanalysis, we discovered that piteraqs are not simple meteorological events. They are created by a fascinating combination of factors and phenomena that includes the atmosphere, mountains, ice sheets, and fjords. And when we added in satellite data from the U.S. National Snow and Ice Data Center, we saw that the impacts of piteraqs could extend well beyond local towns. Piteraqs also affect glaciers, sea ice, and ocean temperatures in the Atlantic Ocean. By cooling the surface ocean downstream of the coast, they could even influence changes in ocean circulation and climate throughout the entire North Atlantic region from the east coast of the United States to Europe. The Greenland Ice Sheet cools the air directly above it. Colder air is denser and it sinks, forming a separate layer of colder air with warmer, more buoyant air above it. Like two other “fluids” with different densities—air and water—the layers of cold and less cold air masses don’t mix and maintain a boundary between them. This reservoir of bitterly cold air over the ice sheet supplies the fuel for the piteraq. 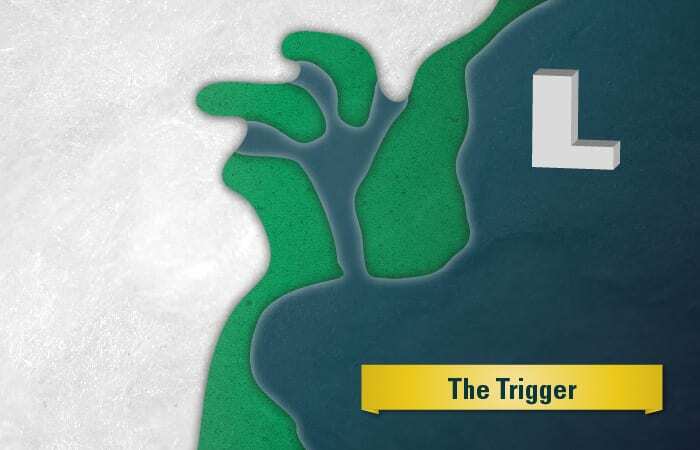 The trigger seems to be low-pressure systems, or cyclones, that occur frequently east and southeast of Greenland. As low-pressure air rises in vortexes, air rushes into the lower atmosphere void to replace it. It creates a spinning swirl of powerful winds that sneak up behind the reservoir of cold air over the ice sheet. The cyclone winds push the reservoir of cold air downhill in a jolt, releasing its bitter stockpile like a broken dam. When the cold air rushes downhill, several different forces combine in complex ways to spawn and intensify piteraqs. Among them is a fascinating phenomenon called a mountain wave. Waves occur along the boundary between two fluids of different densities. Unlike a wave of water that rolls onto a beach, it is hard to see the mountain wave in the atmosphere, because the separate layers of warm and cold air are not as easily distinguished. The mountain wave results in a squeezing of the lower layer. As the volume of cold air is suddenly forced into less space, it needs to accelerate out of its confines and dashes downward along the steep slopes. During the piteraqs, the mountain wave becomes so steep that it breaks, like a big wave of water that collapses and crashes onto the shore. 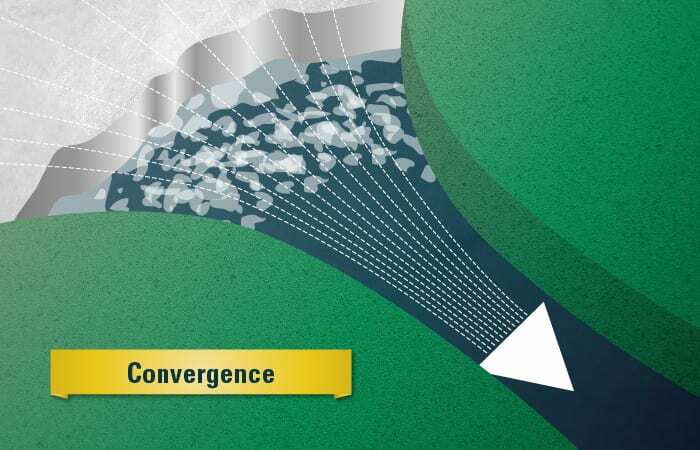 When the wave breaks in the atmosphere, it not only creates a lot of turbulence, it also allows a second driving force to come into play: gravitational force. 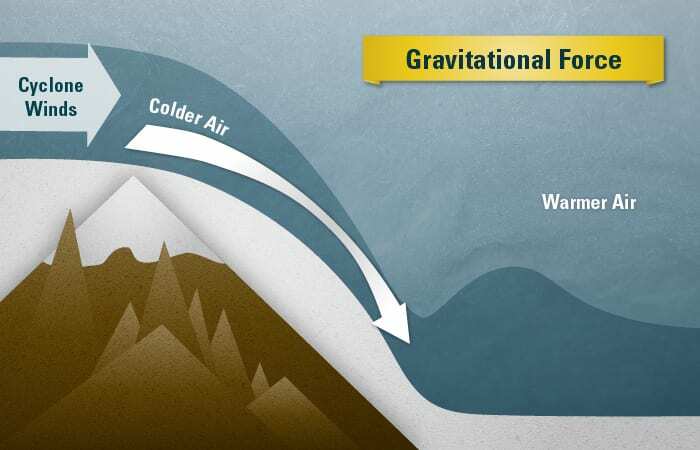 Gravity accelerates the speed of anything falling downhill, even a mass of cold air. The air picks up speed, increasing the strength of the piteraq winds. At the same time, other aspects of topography play a role in driving piteraqs. Tasiilaq is located inside a valley, which funnels the flow of cold air into a smaller and smaller space, increasing its velocity over the ice sheet toward the fjord. By the time the air reaches the fjord, it shoots out at top speed. Unlike an avalanche, however, the cascade does not stop at the foot of the mountains. It carries the cold air and fast winds far past the coast out to the open ocean, where another fascinating air-sea interaction occurs. The Gulf Stream and the North Atlantic Current carry waters from near the equator a long way northward to the Greenland coast, and so wintertime ocean temperatures there can range as high as 45°F. In winter, when the contrast in temperatures between ocean and air is higher, heat from ocean waters is released into the atmosphere, and the ocean waters cool down. Just the way cold air sinks down over the ice sheet because it is dense, cold water also sinks from ocean surface toward the seafloor. This sinking of surface seawater can act like a pump for the large-scale circulation of the ocean. As the waters sink down, other waters flow northward to replace them—carried by currents like the Gulf Stream. That heat released by the ocean warms the North Atlantic region, especially northern Europe. If it weren’t for this ocean circulation, the climate in northern Europe would be much colder in winter. 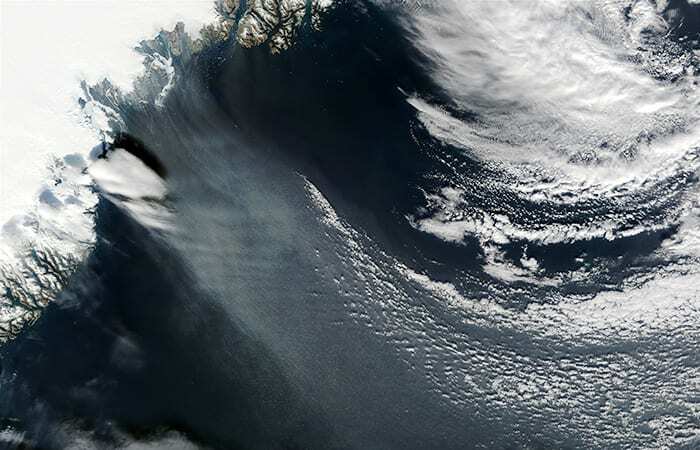 Wind events such as piteraqs, which bring icy blasts of cold air out to ocean, may trigger the release of ocean heat to the atmosphere, which in turn, makes ocean waters cooler and denser so that they sink. These winds events may drive ocean waters in the Irminger Sea off Greenland to lose their heat and buoyancy. So we’d like to investigate how much piteraqs actually contribute to driving the sinking and the heat transport of this ocean circulation, and thus regulating our climate. Piteraqs may also influence climate in another way, closer to the coast. When their powerful winds blow out into the fjord, they can push away icebergs and sea ice inside the Sermilik Fjord. Piteraqs can even break up and clear away ice that’s connected or “fastened” to the land. At the interior end of the Sermilik Fjord, the Helheim Glacier, though seemingly stationary, is actually flowing, continually and slowly pouring ice down the mountains into the fjord. Land-fast ice and sea ice act as dams blocking the flow of ice to the ocean. Some scientists theorize that when this ice is removed, Helheim Glacier can flow faster and push more ice into the ocean. When we compared our piteraq data with satellite observations of sea ice, we found that piteraqs reduced the sea ice cover inside Sermilik Fjord by 29 percent and also reduced the sea ice in the coastal ocean outside the fjord by 26 percent. The sea ice pushed out to warmer waters offshore melts, and this could also have far-flung impacts. As more ice melts, it adds fresh water to the ocean surface. Fresh water is more buoyant than salt water, and this dilution could reduce the sinking of ocean waters, slow down ocean circulation, and affect regional climate. All in all, the impacts of piteraqs are substantial and can extend far beyond Tasiilaq, where the strong winds occur, so it behooves us to unravel more about how they work. Reanalysis techniques will only take us so far, because often there are not enough observations to render an accurate picture of reality, or the physical laws are not sufficient to fill in all the gaps. Thus, there are still many open questions regarding the details of the processes that occur in the atmosphere, land, and sea during piteraqs. Further investigation with new methods will allow us to move forward to find out more about these fascinating, life-threatening, and glacier-, ocean- and climate-shifting storms. This research was funded by U.S. National Science Foundation and the Natural Sciences and Engineering Research Council of Canada.